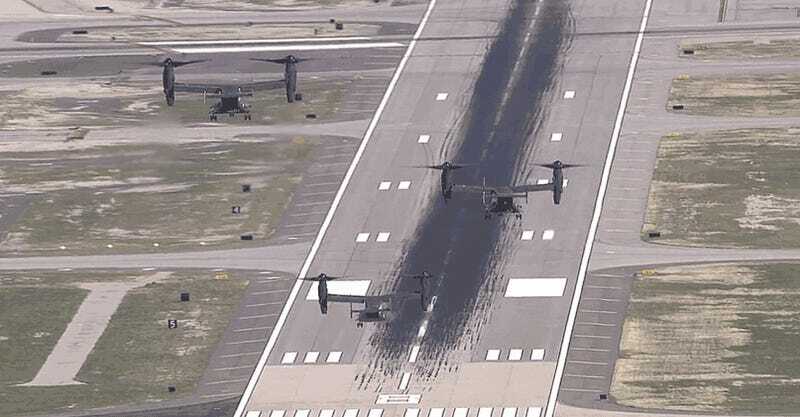 Los Angeles’ KTLA news chopper crew was flying around when they happened to spot a trio of HMX-1 MV-22 Ospreys doing a familiarization flight ahead of President Obama’s visit. They quickly spun their stabilized HD camera with a super-long zoom lens onto the flight. The result was footage worthy of the best Michael Bay film—including a perfect flyby of the Hollywood Sign. Bravo to the chopper’s camera operators; they captured just the right mix of wide angle and telephoto shots and the pilot put the camera in perfect position for every phase of the Ospreys’ flight along the LA Skyline. HMX-1 sends helicopters to nearly every location President Obama travels to, even if the White House plans on using the motorcade. Most of the time a pair of VH-3D or VH-60N “White Top” helicopters (Marine One when the president is onboard) are unloaded from a C-17 and then assembled on-site. They are then flown to make sure all the systems work and to give the crews an idea of their surroundings. They are then stored in a hangar out of sight where they will be on alert for contingency operations while the president is in town. When the White House plans on using airlift to move the president at a location, the aforementioned helicopters that serve as Marine One and the decoy/spare are also accompanied by a handful of support helicopters. These “Green Tops” carry the president’s staff, key press and the Secret Service’s counter-assault team. Before HMX-1 was assigned the MV-22 Osprey, these helicopters would have to be airlifted from their base in Virginia or HMX-1 would borrow CH-46s or CH-53s from a Marine Corps Air Station in the region. Today, the MV-22s, which have far greater speed and range than their predecessors, often self-deploy to their destinations without the need to be folded up and moved via a strategic airlifter. Think An Osprey Is A Transformer In The Air? Check It Out On The Ground! Once at their location they execute familiarization flights to get them prepped for the presidential airlift mission in the coming days. This is exactly what you are seeing in the amazing footage above.